Home resales slipped for the 3rd straight month, according to data from the National Association of REALTORS®. The Existing Home Sales posted a 1 percent drop from May as the number of homes sold fell to a seasonally-adjusted, annualized 4.77 million units. It’s the monthly report’s lowest reading since November 2010. The report also showed the national supply of homes for sales rising to 9.5 months — also its highest reading since November 2010. 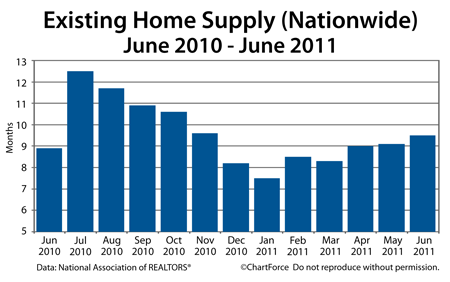 Home Supply is the amount of time it would take to exhaust the complete home inventory at the current pace of sales. June’s Existing Home Sales data would have been stronger if not for a high contract cancellation rate. As compared to May’s 4 percent rate, June’s cancellation rate was 16 percent; an elevated figure that “stands out in contrast” to what’s typical, according to the REALTOR® trade group. This disparity from region-to-region highlights an important housing market concept. Namely, that all real estate is local. Because just as the Existing Home Sales varies on a regional level, it varies on a state-wide level, too. What’s true for California housing is not necessarily what’s true for Florida housing, for example. Each of the 50 states has its own trends, and within those 50 states, there are thousands of cities and neighborhoods, each with their own trends, too. The “national housing market” doesn’t exist, so national data is rendered somewhat useless. For data in Nashville or your local market, talk to your real estate agent.